Disclaimer: This piece of article is for the sole purpose of fun and sarcasm. No responsibility for anyone taking a leaf outta this article is hereby accepted(means that I am not responsible for any idiot taking his ideas from this article). Ya, I almost forgot, CHEATING IS A CRIME. Cheating: to act in a dishonest way in order to gain an advantage, especially in a game, a competition, an exam, etc. Well, in the good old days, when there were no schools or Universities, people used to buy the books directly, apply for an exam they wished to attend(like 7,10 etc..) and study for it just one month in advance before the final play. It helped them a lot, although not giving them the good percentage(like that mattered). But the availability of jobs and the scarcity of competition can be cited as the reason for the success of that kind of clan. But now the times have changed and so has the competition. We now have about a thousand guys for one job. This led to the strict measures of filtering by the HR's of the respective companies to select the best suited guy for his organisation. To equal the standard maintained by those Organisations, our universities(OU, JNTU etc...) have increased the syllabus of the courses they are offering. The Universities thought that maybe, by increasing the scope of the syllabus would make their alumni more oecumenical. So naturally by implication the hieght and width of the books have increased making it difficult for the average student to study that in one month or in case of a B.Tech Student-one night. So an alternative form of scoring seemed essential for the upholding of the marks. This alternative form, as many thousand(or maybe lakhs who knows) of students found, is in the form of cheating. We'll discuss some of the most common ways of cheating first. Well for many years now, and many years to come, bringing information on scraps of paper will be the classic way of cheating. Although this might seem easy at first, it all depends on the proctor present. Now I've seen many funny scenes involving this kind of cheating. Why, not even two months back, when a fellow was trying to throw a chit to his friend, the chit went flying into the invigilator's lap. That was one good laugh till the lecturer found out who threw that chit. More of that later, but coming to the point, the classical copy involves a fair bit of hard work before the exam. I mean, the concerned student has to-first tear the paper into the correct proportion of bits, then use a ball point .5mm tip pen to write the subject on that bits of paper with astounding font size(requires heavy experience). 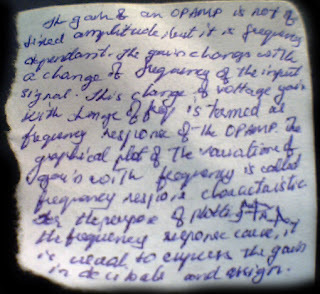 One small strike while writing on the chit paper, then he has to write the whole thing all over again. Although two or three strikes may help the referred student learn the answers pretty well, this classical way of copying is a hard one to cover. Once completed, then the real play begins in the exam. Imagine watching a student trying the classical copy method from a side angle. This fellow will start by inserting his chit in the paper(answer sheet or below the desk).He will try to look innocent and keeps watching the examiner if he has been discovered(not to mention the sweating). Then he will start turning the paper over and over again trying to decipher the code he himself has written till the proctor's suspicion is raised. Although a student may even try putting the chit in the examination hall before the exam to reduce his risk factor, this method is a goner in the externals because the students are not allowed inside the examination hall before the exam commences. All an invigilator has to do to catch the student is check the students answer sheets. Once caught, then the punishment recieved will be grevious. You must have listened to this proverb-"Ask and you shall be answered".If you lose a sense of direction when you are going to a new place, you ask for somebody's help. If you think I am comparing this with the Asking act, then you are so woefully wrong. Cheating is a crime. 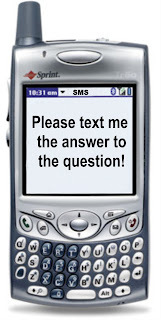 Anyways, this act involves asking the person in front, beside or behind the concerned student for a clue or an answer. I've seen many "first years" performing this silly act. The only problem in commiting to this, is that one has to use one's voice to receive help from others. This makes them vulnerable. If the proctor is in a close range or has sensitive ears, then there's no way to get out of this. You have your hands and your legs for a reason or so they say....Writing the info on hands(palms, between fingers, arms) and legs(soles) seems to be the easiest way of performing this way of cheating. I've seen guys writing the formulas on the paper as soon as they enter the exam hall and then immediately erase them from their hands or legs. Normally people write on the desks with pencils and then erase them as soon as they copy that into their paper. This is same as the above method 'Using Yourself'. But the desks are thoroughly checked before every exam. So guys thinking of attempting this way can take it out their mind. This has long been taken care of. Cell phones are banned in colleges. That put a full stop to this way of cheating. Anyways guys with guts still attempt this one. 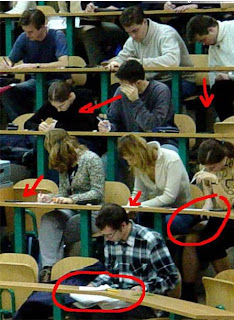 But they have to first enter the text in their PC's or cellphones before the exam, then bring it to the hall escaping all the checkings, then find a way to open the cell in the exam. But one thing has to be made sure. If the mobile is not in the silent mode, then I need not tell the consequences. A tone of "Chal Chaiyya Chaiyya" is bound to raise the suspicion of the proctor. But the times are changing along with the technology. Even I-pods are being used now-a-days. Instead of all this ways of cheating stuff, one could always simply study for the exam, which would be the best way to score marks and be satisfied with that marks and thats saying something. Although the syllabus does not permit writing chits on paper and on hands, its always best to be prepared mentally rather than resourcefully. You may ask me, what if one fails in an exam ? Well, there's always the supply's as a support. If I could take time to write pages and pages of rubbish on this boring topic, and you could study this crap, than why not others can just simply study for their exams. Anyways I've said it before and I am saying it now, Cheating is a crime and the punishment involved would be severe.